Welcome to the second post of the Julie Kagawa Month. If you don't know what this is, you should check out this post, and then come back here. 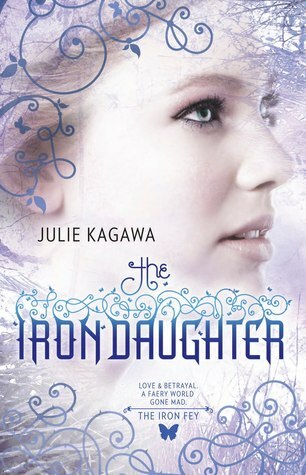 Now it's time to review the equally good (or even better) sequel, The Iron Daughter. For the second time, Julie Kagawa did the nearly impossible. She wrote a series, that keeps getting better! I think I loved The Iron Daughter even more than the first book! I have big hopes for book three. I will really try to write this review without any spoiler of book one, but be aware. And why the heck haven't you read it yet? The Iron Daughter leaves off right where The Iron King stops. All our favorite characters are back in all there glory and then some! Meghan.... What can I say about her? I adored her in book one. But at the begining of this book, she was so not herself. I just wanted to slap her! Thank God she got better throughout the rest of the book. Now I can say that I love her even more. Ash and Puck were once again beautifully written! I can't say nothing bad about them. Some of their moves were unpredictable *cough AshAndVirus cough* But that's what we are all looking in a book, stuff that we don't imagine happening to our favourite characters! The plot was truly unbelievably brilliant. Julie Kagawa really out did herself. She once again captured the attention of her readers, delivering a pure and griping plot, in an engagin, entertaining and enchanting world! And the end of the book.......Speechless. I did not see that coming. I could really say that Kagawa is a genious for creating everything in this book, and making me fall in love with it.Loved every second of this epic adventure and I am crazily waiting to see how this beloved series will continue in The Iron Queen.